This week the parliament's constitutional commission reached consensus to hold the country's first presidential elections in 2014. The decision allows Prime Minister Erdogan, who under the AKP's by-laws cannot continue to serve as leader of his party after 2015, to run for president. This would allow Erdogan to stay at the top of the political scene and work to realize his plans for Turkey's centennial in 2023. This calculus is likely behind Erodgan's desire for a strong presidential system modeled on the United States and/or France, a move that would require a drastic reworking of Turkey's parliamentary system but might well be up for debate as parliament continue to work on provisions for a new constitution to replace the 1982 constitution drafted under military tutelage. Yet enacting a presidential system will not be easy given that the AKP is shy of the two-thirds majority required to unilaterally pass amendments to the constitution, as well as the three-fifths majority needed to pass amendments and then take them to referendum. Amendments passed in this way require only a simple majority, which the AKP, as it did in September 2010, would likely have little difficult attaining. That said, the party is just three votes shy of the three-fifths needed (it currently has 327 seats of 330) to bring amendments to referendum. So why is this week's decision so important? When Turkey amended its constitution in 2007 to hold popular presidential elections (before presidents were elected by parliament), the law was also changed to allow two consecutive five-year terms rather than one seven-year term. The question that is now near decided (parliament still needs to vote on the measure) is whether the new law applies to President Gul. Would Gul serve one seven-year term? Or, would he serve one five-year term and then be allowed to run for re-election, a move that would frustrate Erdogan's ambitions and remove him from the top of Turkish politics after 2014? Though the delay deciding the issue essentially de facto scheduled elections for 2014 since there was little possibility of holding elections this year, the matter is now more decided. Now the question is more what will happen to the AKP after Erdogan becomes president. Will President Gul take the post or will it go to someone more junior over whom Erdogan can exert control (or, to a candidate like Deputy Prime Minister Bulent Arinc, who recently sided with Gul over Erdogan when the two were divided over a law reducing the penalty for match-fixing and over whom it might be more difficult for Erdogan to assert control)? If the latter is to happen, parliamentary elections will have to be moved from 2015, for when they are currently scheduled, to a year before, meaning that Turkey would hold presidential, parliamentary, and local elections in the same year. And, just as important, will Erdogan be able to enact his constitutional vision and expand his power after 2014? The Radikal story linked to above has the details about the new law. UPDATE I (1/26/12) -- President Gul has approved the new law fixing his term to seven years, and so setting Turkey's next presidential elections for 2014. The new law was passed quickly by parliament on Jan. 19 despite opposition from the CHP, which is still deciding whether it will challenge the legislation at the Constitutional Court. 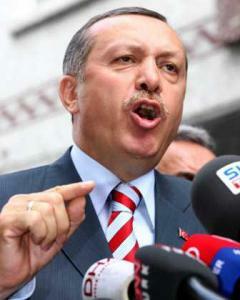 Prime Minister Erdogan is thus cleared to run for president in 2014, becoming the first popularly elected president. Erdogan will be allowed to serve two five-year terms, and if he wins a second, he could well be president when Turkey celebrates its centennial in 2023.